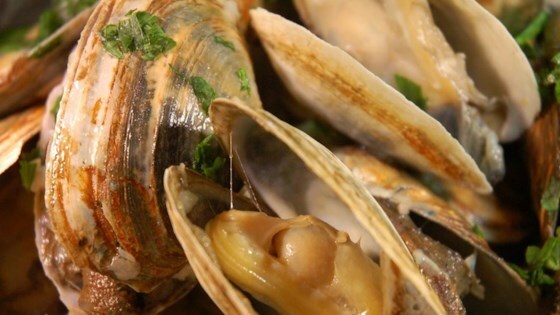 "So simple, but so good - steamed clams served in their own liquor. Serve with a crusty Italian bread, or over pasta." A tangy garlic mayo is the key to these easy steak sandwiches. Try with a Sauvignon Blanc or an Oregon Pinot Gris. Mine came out very salty. I gave this recipe a double punch after cooking with another big spritz of wine and salt/lemon. Cover and simmer one or two more minutes... its seems to bring the broth to new heights. Great EASY recipe! Steamed about 15-20 minutes. Served with Ceasar Salad, corn, and garlic/butter rice. Make sure you have some good dipping bread! Makes a lot of juice!